At Canonbury Antiques we send goods – valuable, often very delicate and fragile, like porcelain – to every part of the world. We have been doing this for many years and of course want you to feel confident in how these goods are packed to ensure they arrive safetly and in one piece. There is nothing worse than buying something that arrives broken and of course it is in our interest that your purchase arrives safe. Otherwise we will have to refund you. When packing we work on the premise that if this box was dropped from a height of ten feet or more would the contents remain unscathed? With our packing it would. This is because it’s hard to control what happens when the box leaves our premises and ends up on a UPS conveyor belt or dropped by a handler. The photo gallery below shows a step by step of our packing process. In this case it is an antique Chiparus bronze with a marble base and it was double boxed. 1. The bronze is wrapped in bubble wrap. 2. Marble base is reinforced with cardboard. Must be protected from any chipping, scatches, dents and cracks. 3. Whole bronze is then surrounded by custom sized cardboard box which is cut down to size. Then totally insulated with lots of foam polystyrene (styrofoam) peanuts so that there is absolutely no movement in the box. 4. This cardboard box is then put inside another cardboard box. The outer cardboard box is insulated with polystyrene (styrofoam) boards and then more peanuts are put in the box so again no movement. 5. Box is heavily taped up. Box is taped with FRAGILE tape and stickered to clearly mark which way the box should be carried upwards. We are confident if this box was dropped from a height of ten feet the bronze would be safe. Please be reassured when you buy from us we will do our 100% best to ensure the goods arrive in one piece. 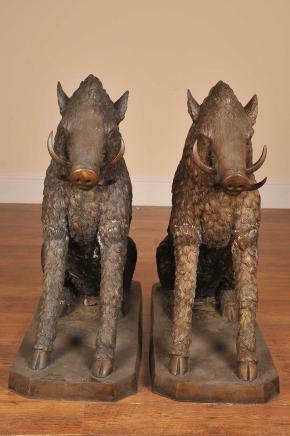 You are viewing an incredible pair of boars cast from the finest bronze. They are a perfect left and right and have been cast from the finest brown bronze with a gorgeous brown patina. The piece is signed by the artist A Canova on the corner of the base (please see close up picture). Being bronze these can live outside with no fear of rusting and these would make for a great ornament for your home or garden. The artist has really caught the poise and beauty of the creatures with great skill. The texture of their coats has been faithfully rendered along side their funny expressions, long snout and curled teeth. Both bronzes are offered in perfect condition ready for home use right away. We aquired these from an auction in Southgate North London. We can ship them anywhere in the world.